MamaLittleHelper LLC have recalled their infant and toddler hammocks. The side-to-side shifting or tilting of the hammock can cause the infant to roll and become entrapped or wedged against the hammock’s fabric and/or mattress pad, resulting in a suffocation hazard. 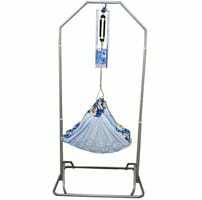 This recall includes MamaLittleHelper Hammocks with model numbers 1010, 1020 and BL222. They have a steel frame and a fabric hammock with a mattress which are connected by a large spring, safety rope and a metal hanger. Model BL222 has a computerized rocker device. It was sold exclusively on the company’s website from May 2009- February 2010 for between $100-$230. Parents and caregivers should immediately stop using the hammocks and find an alternative, safe sleeping environment for their baby. For additional information, contact MamaLittleHelper (866) 612-9986 or visit the firm’s website www.mamalittlehelper.com/recall.htm.